Pot should have raised rack, minimum 2 inches high. Add equal quantities water and vinegar to just below level of rack. 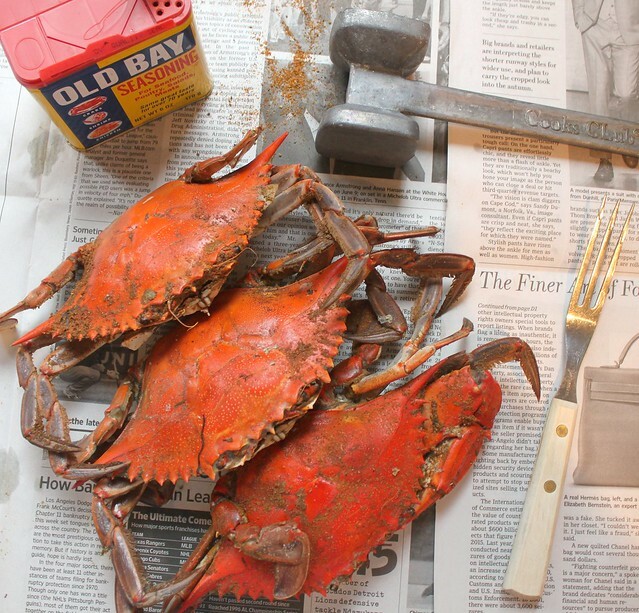 Layer crabs; sprinkle each layer with Old Bay. Cover and steam until crabs turn red, about 30 minutes. Wow... I lived in Maryland for about 20 years.... Steam Crabs always my favorite, and these look so good. I have eaten 100's of crabs in my life, though it's been quite a while since as I've lived way away from the shore. Your pictures and that Old Bay can take me to a wonderful place. Brought a tear to my eye. ...Oh, and I love that you placed your crabs on top of The Wall Street Journal. How very sophisticated. Crabs, one of my favorite things on the planet! How lucky - what a beautiful memory ( I love cooking in memory of people) - and how amazing to have known your great grandparents. Your photos of the crabs are divine!! Thanks Nicole! XO :) Love your blog! What a fabulous memory. My grandmother grew up wallowing in the Mobile Bay (her words). If I can learn to clean a crab in half the time that she can (at 87 yrs old), I will be thrilled. What gorgeous photos of gorgeous crabs. A lovely and delicious way to remember your great grandparents. Happy 4th of July. I can pack away 30+ steamed crabs. So good! I immediately noticed the picture on Foodgwker (or was it Tastespotting?). Beautiful. And such a nice way to remember someone you love. Love the photos here, and love food that reminds us of our pasts. So nice to have a certain food or dish that brings back memories like this! What a fantastic tribute to Ocean Mom Mom!! 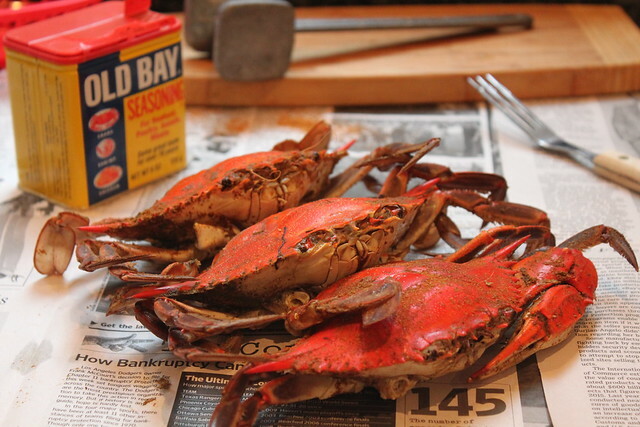 Try using beer/vinegar instead of water... and mixing the old bay with kosher salt! Oh how we love our crabs! First. You need a picture of the live crabs...preferably pinching one of your little ones (that would be a great pic if you timed it right). Second. My Dad is the master of all master's when it comes to picking crabs! Third. Great post. 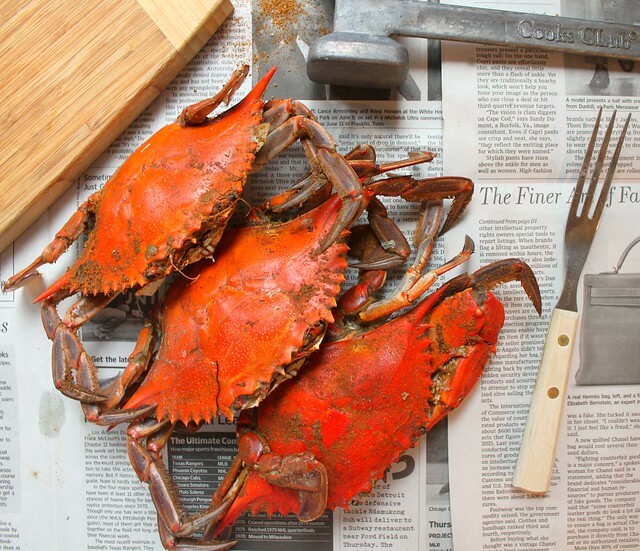 Makes me miss being in Maryland and eating crabs during the summer months. Raw Oysters ~ Gone Fishin' ~ Be Back Soon!